Atari appeared to be winning the battle of the 16bits. A combination of a very generous software bundle, price drop and big ad campaign saw sales of the ST see a rise even during the usual summer slump. Meanwhile, the Amiga was still having problems with reliability - some shops putting returns as high as 25%. Software sales were reportedly 70/30 in favour of the ST.
A small South Wales company called Miles Gordon Technology (MGT) was about to release a Spectrum "super clone". The SAM would feature 256K standard, upgradeable to 512K. Retailers doubted whether it could make an impact, and so it was only going to be available by mail order. Code Masters confirmed it was moving in to full price games. The first was rumoured to be an Activision reject. The company also said that it was going to start producing games aimed at girls. Telecomsoft and Hewson resolved their legal conflict over two Graftgold games ("Morpheus" and "Magnetron"). The dispute arose at the previous year's PCW Show when Telecomsoft lured Andrew Braybrook and Steve Turner away from Hewson. According to Gallup, the Spectrum (24%), C64 (17%) and Amstrad (15%) still accounted for at least 45% of all home computers in Britain despite the arrival of the ST and Amiga. 8bit software sales also increased substantially - were 16bit owners still buying 8bit games for their old machines? Rumours continued about a possible 16bit games machine from Amstrad. Details continued to be contradictory (it wouldn't have expansion ports, but it would be called the Sinclair Professional PC etc). Walt Disney announced that for the first time they would be using computers for the animation in "Oliver and Company". The final cells would still be hand painted, though. Apple posted a three month profit of US $91.3 million, 71% more than the same period the previous year. The growth was attributed to the success of the Mac II. Mirrorsoft launched a new label: Imageworks. The focus would be on new, original content rather than arcade ports and licenses. The first title was "Skychase" from a small US company called Maxis, with several big name developers signed up for more. Jon Ritman and Jeff Minter were contributing to a new game by Tony Crowther and David Bishop ("Bomb Uzal"), Denton Designs was working on "Foxx Fights Back", and The Bitmap Brothers were cracking away at a "futuristic sport game" called "Speedball". Three former Sinclair Research people had formed a company to produce a new games machine called the Flare One. Rather strangely they had opted for a Z80 with two custom chips and 768K of RAM. The group had approached Amstrad with the machine, but were turned away and now another unnamed company was interested. From what I can tell, it never came out. TGM sounded the warning of computer crime which had, for the first time, eclipsed the money stolen by traditional methods. Bank accounts, credit cards and so on were all vulnerable and there seemed little that could be done about it. The Archimedes received a full feature, with a series of reviews. Rather than do his usual column, Mel Croucher instead published a rebuttal penned by another TGM writer to his previous month's column arguing that the cases he had put forward for film makers plagarising other works were at best weak. A huge preview of the Personal Computer Show, detailing what could be expected from all the stands and the various other events. There was a look at the options for TV viewers in the UK. With Murdoch and Maxwell both launching satellite services there was an ever increasing variety of channels on offer. But the satellite companies were losing money hand over fist - could this trend be turned around? TGMs look at all things Cyberpunk continued, this month focussing on the books of William Gibson and others (Bruce Sterling, Walter Jon Williams, Michael Swanwick, Michael Weaver and Lucius Shepard). The third round of qualifying for the Computer Games Championship took place. 10 competitors remained and would go on to the PC Show where the winner would be decided. Domark laid out their upcoming releases "Return of the Jedi", "Live and Let Die", "Trivial Pursuit: A New Beginning", and the official "Spitting Image" game. A new shooter from Thalamus was due for release in September. "Armaltye" was hyped to be the best shooter yet on the C64. Andrew Braybrook's new game was revealed to be "Intensity" and would be published by Firebird. "Powerdrome" was the first EA game developed in the UK and was due to hit the selves in September. EA had several other games up their sleeves, including "Battle Chess" and "Neuromancer". The latter would feature a sound track by Devo. Melbourne House won the rights to develop "Double Dragon" for home computers. "Conqueror" Superior Software - Archimedes 87% "with more depth than Superior's previous Archimedes game, Conqueror is a change towards the more strategic style of game and as such is a change for the better - a product that is addictive and challenging in both the arcade and strategy sense of the word." Rather bizarrely the review opened with "Conqueror was written by Jonathon Griffiths, known more familiarly as David Braben...". The engine was indeed the one Braben had written for Zarch/Virus but I'm pretty sure Griffiths was not a pseudonym used by Braben. "Whirligig" Mike Singleton/Firebird - Amiga/ST 83% "Whirligig is clearly another masterpiece of coding that, very much like Virus, has relatively simple gameplay - fly around, shoot things - but an exceptionally difficult, mouse-only control system." "Bard's Tale 3: The Thief of Fate" Electronic Arts - C64/128 84% "The Thief of Fate is a considerable improvement all round, best of the series yet." "Skychase" Maxis/Imageworks - Amiga 87% "The large number of redefinable variables and the option for unique strategies in air combat make Skychase and excellent game." 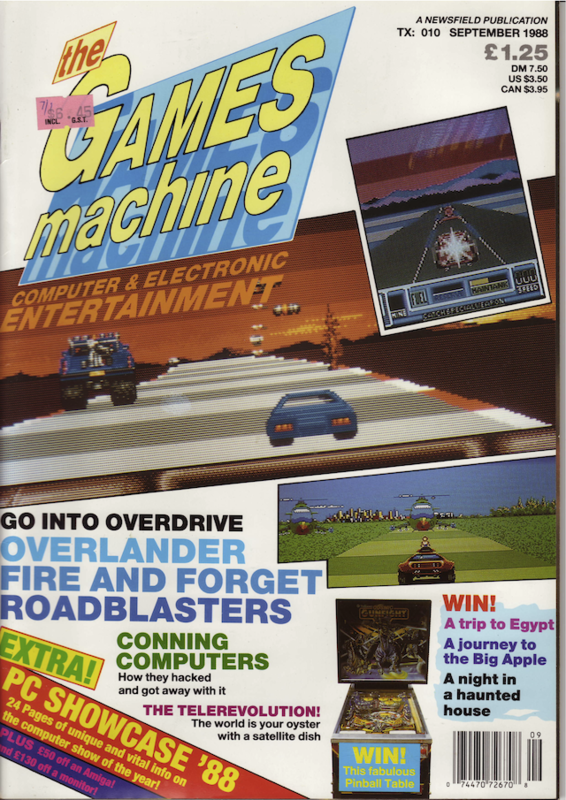 "Overlander" Elite - ST/Amiga 82% "Overlander is a very good game of its type, the best so far in all-round presentation and speed, though it suffers slightly for being too easy." "Tracksuit Manager" Goliath Games - C64 88% Spectrum 83% "This is a prime example of a game where it's the strategy that counts and the Commodore delivers the goods extremely well."